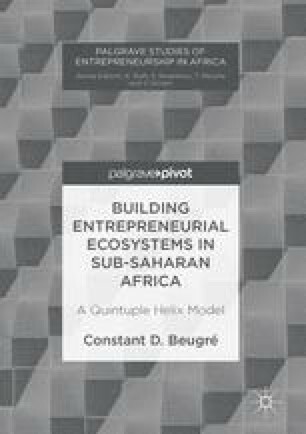 This chapter emphasizes the role of the private sector in the development of entrepreneurial ecosystems in sub-Saharan Africa. The private sector is loosely defined and includes companies owned by locals, companies owned by foreigners, and subsidiaries of multinational corporations. The private sector can provide financial support to universities and to business incubators. It can also collaborate with universities on joint research programs that could lead to the development of new products or services. The private sector can also support startups by providing financial resources or becoming suppliers or clients.